From the 1930s to the 1960s, The World-Light Manufactory was one of the most prominent industrial enterprises in Hong Kong, best known for its Globe brand (地球牌) of hurricane lanterns – kerosene lamps which are resistant to rain and wind and ideal for the outdoors. While the firm and the family behind it is largely forgotten today, they played an important role in the industrial development of Hong Kong and in the career of a famous HK industrialist/politician, a famous scientist in the mainland and a famous Chinese painter. World Light was founded in 1933 as World Light Factory by Nanhai native Lai King-ha (黎景夏, 1888-1970) also known as Lai Pak-mun (黎伯敏) and his younger brother Lai King-yan (黎景殷) in 1933 with King-ha as chairman and King-yan as managing director. Lai King-ha grew up in Hong Kong where he attended Queen’s College before studying engineering at the Chiao Tung University in Tangshan. King-yan also went to Queen’s College and founded True Light Battery Factory (眞光電池廠) in HK in 1930 before co-founding World Light. The brothers chose hurricane lanterns as their focus to compete with foreign brands such as the German firm Nier Feuerhand which was the biggest producer of hurricane lanterns in the world founded in 1893. The original World Light plant was located at 26 Fook Chuen Street in Shum Shui Po but as business took off, the firm moved to bigger location at 23 Bedford Road in Tai Kok Tsui in Kowloon in 1937 where it would remain for the next several decades. At its peak in the pre-war era, World Light employed 700 workers and had factory space of 30000 square feet. From hurricane lanterns, World Light expanded into the related business of glass manufacturing and glass printing under the name of World Light Glass Factory. 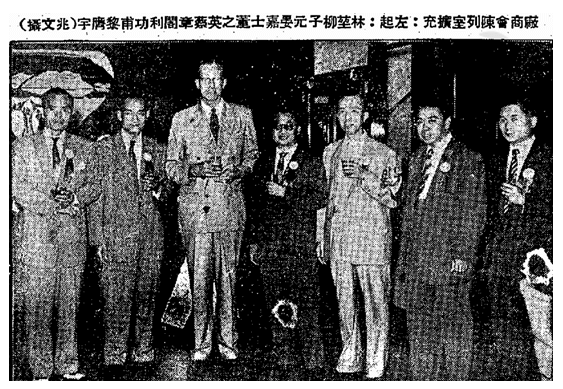 Its glass operations, located at 955 Tong Mi Road in Mongkok, was responsible for printing letters on Dairy Farm milk bottles and Connaught Aerated Water soda bottles. It also manufactured irons under the “Cog-Wheel” brand, cotton sewing thread and aluminum products. The primary export market for World-Light’s hurricane lantern was Africa (although it also shipped to Southeast Asia, the Americas, Near and Middle East) and the early post-War years were prosperous as World-Light’s products were less expensive than its US, European and Japanese competitors but at comparable quality. One of the Lai brothers – Lai King-sung (黎景宋) went to HKU and worked during the War at a machine factory in Jiangxi province alongside his classmate Sze-yuen Chung (鍾士元, 1917-). When World-Light needed to expand production in HK after the War, he asked Chung to join the firm as Chief Engineer in 1946 at the monthly salary of HK$1000 which was a tidy sum at the time since a female worker only earned $3 per day. In 1948, Chung went to the University of Sheffield in the UK to pursue his PhD in engineering and when Dr. Li Hsun (李薰, 1913-1983), the metallurgy expert at Sheffield had trouble getting the visas to leave the UK to return to Communist China in 1951, it was Chung who enlisted the help of Lai King-yan at World-Light to pretend to hire Li and sponsored his visa to HK. Once Li landed in HK, he was immediately redirected to Beijing where he joined the Chinese Academy of Science to establish its Metallurgical Research Institute which contributed significantly to China’s steel and defense industries in the next several decades. (Lai King-sung also turned out to be a Communist Party member and ended up living in Beijing where he worked for Xinhua News Agency and technology transfer for many years) Chung returned to his old position at World-Light after graduation in 1951 and later became Deputy General Manager of the firm but the downturn in the African economy in 1952-3 resulted in World-Light suspending its operations and Chung left to set up his own consulting practice and eventually ended up starting the flashlight maker Sonca with the backing of V.K. Song (see article on the Song brothers for details) and enjoyed a long political career. By 1955 however, World-Light appeared to be back on track and business had resumed. By the 1960s, World-Light’s product range also included battery lanterns, high intensity lamps, slide rules, calculators and flashlight metals in addition to the items described above. 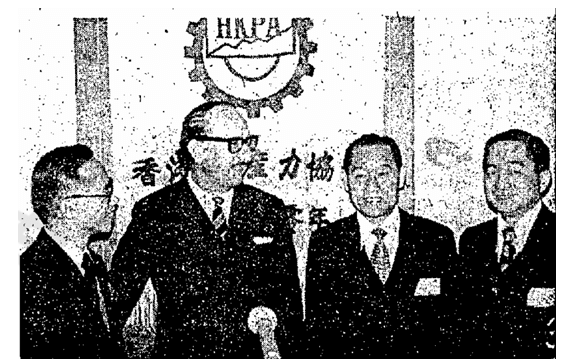 In 1964, the family also incorporated Mun Hing Properties (敏興置業) to invest in real estate. Outside of work, Lai King-ha spent his time at his country residence up on the hills in Tsuen Wan which he called Green Cloud Hill Villa (綠雲山館). There he hosted the famous Chinese painter and calligrapher Li Yanshan (李研山, 1898-1961) in the early 1950s for several years when the famous painter fled Canton to the crowded colony and needed a tranquil environment to paint traditional Chinese landscape paintings. In the 1960s, the firm’s sales office address was listed as 906 Yu To Sang Building in Central while its plant remained at 23 Bedford Road but by the 1990s, its office was located at 56 Hoi Yuen Road in Kwun Tong (45 Hoi Yuen Road was formerly known as World-Light Industrial Building and then Cony Building and now Yau Lee Centre). 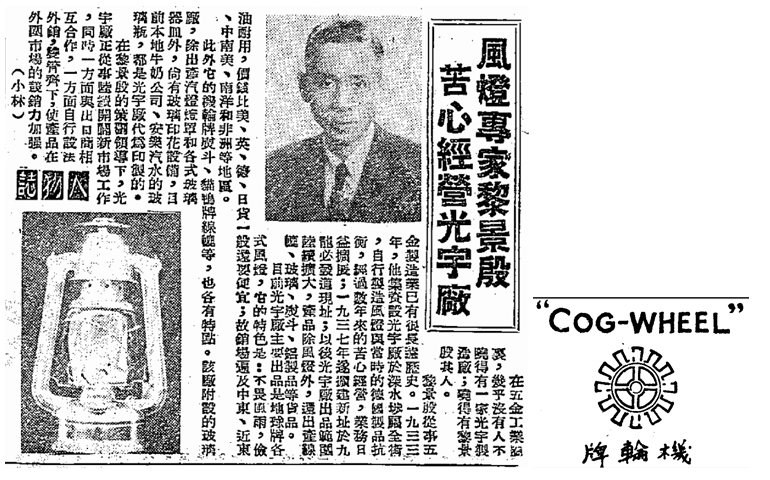 In the 1991 Directory of HK Industries, World-Light’s employee count was listed as 200-499 and annual sales was HK$10 million with focus on hurricane and battery lanterns. As a company, World-Light Manufactory dissolved in 2002 and Mun Hing Properties dissolved in 2008. This article was first posted on 16th March 2018.